Hello, it’s another Rubí Tuesday blog. This is just a short piece to celebrate the foals’ birthdays. It sounds a bit odd to still keep calling Morris my foal, as he is a big beefy boy who is bigger than me now, but he is always my Morris foal. Morris was born seven years ago yesterday and Aitana has her seventh birthday today, as they were born on consecutive days thanks to a conspiracy by Matilde and I to coordinate delivery of our foals in order to create the maximum extra work for the Peasant. Aitana born to Matilde, 2nd October 2011 is seven today. For those of you who follow the blog and have seen the Peasant’s account of Aitana’s mange problem this summer, you may observe that she is now mange free and her coat has grown nicely again over the affected areas. Another panic over… Silly horse. The main thing that has happened recently is that the Peasant has created a corral with electric fence around the house, so we can walk around the house and eat near the foodstore. We also go up and stare through the windows to see what the Peasant is doing, and we bray for carrots. 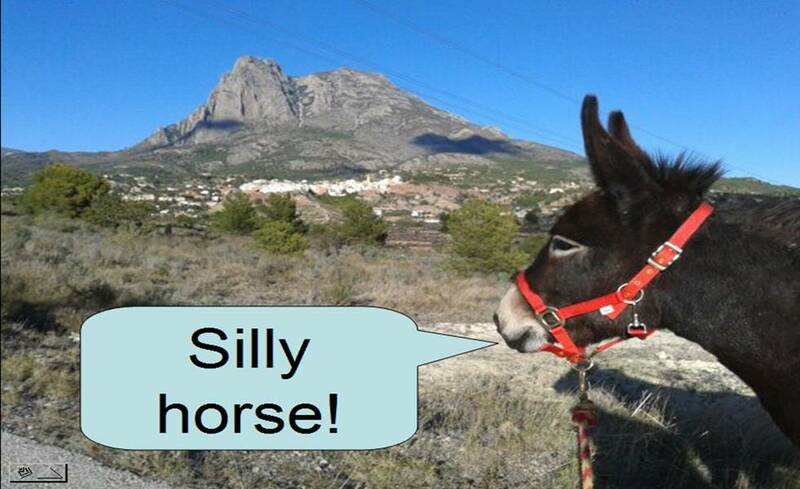 The Peasant will be writing later in the week: prolly another of his interminable blogs about Brexit 🙂 So this is your only donkey fix for the week. Make the most of it. From 2011, here are foals when they were at their springiest! Goodbye Brexit: the nightmare is over! I’m So happy your guys and gals are doing nicely after seven years. Sadly, we had to give our two donks away yesterday (both of them 15 hands and getting to much for us what with weight problems and hoof stuff) but they went to a nice lady north of Seattle who loved them to pieces right from the start and who will fix them up, I’m sure. We hope to get some smaller guys, more your size, who can trim our pasture. You have been an inspiration, Frer Rabit! Prayers and candles being lit for you and your lifestyle. Rubi, Aitana is not a horse – her ears have always been too big to be a horse. Your Morris foal is still as playful and silly as he ever was. Aitana has become a bit too aloof for all that at times… but she still likes a good leap when she feels like it! Happy birthday foals! Hi Jim: I am pleased you have found a home for your donks. Maybe you could get some miniatures: they would still keep the grass trimmed and it would keep them busy! Thanks for your prayers and candles. We have a well-established life here now and four very happy donks, hidden away from all the turmoil and uncertainties of the outside world, and ever-mindful of the need to put more protection in place to take shelter from it! Good luck to Jim’s donkeys in their new home!